There are many books that claim to be the definite source on Reggae Music. So many, that we don't take such claims seriously anymore. And because the music under continual development, it's even logically impossible to create a definitive guide. We're not talking just about a music from the past, or do we? So yeah, we have reasons to be skeptical and even cynical when it comes to "Guides to Reggae". So, what about the Rough Guide To Reggae? After all, on the cover we find claims how the book is supposed to be a "definite guide" as well. The first hint might be to look at the names of the authors. Especially Steve Barrow stands out, as he is the main man behind the legendary label Blood and Fire. This label re-issues classic Reggae Recordings. Through the grapevine, we heard how one well known Jamaican artist (Yabby You) privately speaks very highly about Blood and Fire. They know how to respect Reggae Music and even better, they know how to respect Reggae Musicians! And so, the question is: does the Rough Guide To Reggae have the same mentality and respect as we find in Blood and Fire's products? Well, as a matter of fact, we think it does. In eleven chapters and almost 500 pages, Steve Barrow and Peter Dalton take us to the wonderful and interesting world of Reggae. They don't only tell the essential history of Jamaica's music in a chronological manner, most contemporary genres and developments have their attention as well. Certain styles and studios, artists and producers are highlighted in special articles. There are hundreds of reviews, but they are all accompanied by in-depth analysis which places the reviews in a certain perspective and context. It's an encyclopedia, a history book, a tool to create an interesting Reggae collection. It's an essential in the book case of every serious reviewer of Reggae Music. But no, it's not the definitive guide. That can't be. For Reggae is still under development. But it's definitely the definitive guide for Reggae so far. 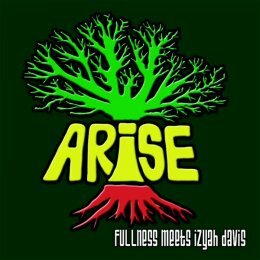 WWW, January 2011 - In this heart-felt Roots Showcase from UK based producer Fullness and vocalist Izyah Davis, the listener is being treated to a massive piece of work in all aspects. From the production to the musical playing, from the vocals to the actual lyrics, ARISE is more than recommended to lovers of (DUB) Roots Reggae. He's not new on the scene, both online and offline: Gavin Sand, or Fullness as we all (should) know him. Yes, indeed; this is a name not to be ignored. Excellent musical playing, crucial production overall but -arguably- even more important: Dubwise of the quality we all love to experience here, as true lovers of the D-word. Izyah Davis adds more than just vocals to the excellent production: in an obvious good vibrational interaction with Fullness, he raises his voice up high to the Most High. From the top to the very last drop, we are being treated with some spiritual food that no righteous rootsman would ever be able to deny. Chanting down Babylon and her iniquity, lifting up the Trinity to the fullness, calling on the people and the so-called leaders, this one is -as said- more than recommended to lovers of (DUB) Roots Reggae.